USA Citizens Vote While Overseas!! With all the lunacy of the primary elections spinning and whirling around me, I knew that Jack and I had to be able to vote in this year’s New Jersey primary election.​ Since we will be in Italy in June and the mail from the United States to Italy is notoriously slow – I didn’t want to risk a mail-in absentee ballot. What is a political junky voting citizen to do? My pal George, who lives in The Netherlands, said that he goes to the American Consulate. Hmmm, do I have to go Naples? 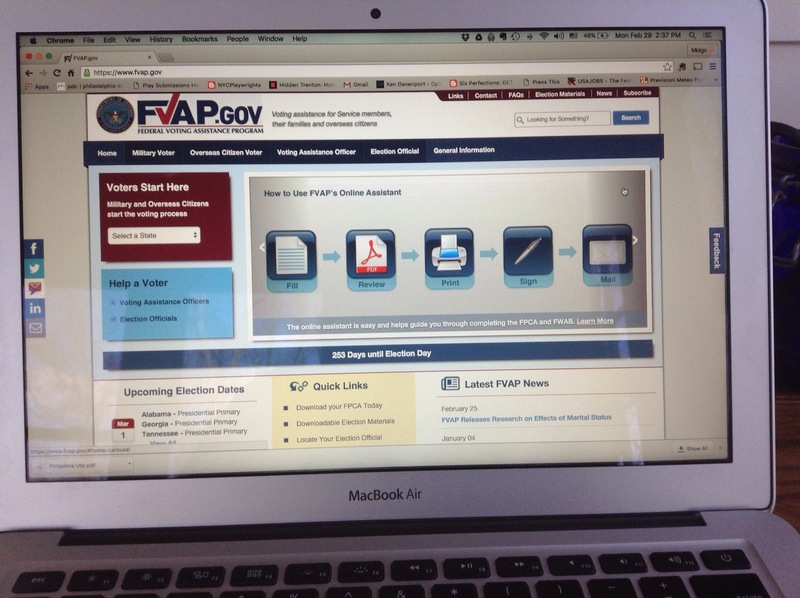 Being a politically savvy chick, I knew just who to call – the Board of Elections! What – I’m wrong? I have to call the County Clerk? Done. I called the Somerset County, NJ clerk’s office and discovered that U.S. Citizens who are out of the country can vote electronically! Who knew?! A quick trip to the web site made me realize that it was not only possible but probable that I would be voting this June from Pontelandolfo! Go Democracy – huzaah! 1. You must register and request an absentee ballot in your state of legal residence. Right – you can’t vote in Oregan and then vote absentee AGAIN from Europe. You complete what is called the federal post card application – it looks nothing like a post card. Hmm, I thought, filling it out online looks pretty simple. POP, up came a privacy statement – click – I accepted the privacy act statement. That means people get to see who I vote for. Who cares – ask me who I voted for and I’ll tell you. The form took forever because once again the big zip code data base in cyberspace would not recognize my zip code. Flagtown has had its own zip code long before Hillsborough coalesced into a quasi community with a post office and zip code. I fought the system and then hung my head and used the Hillsborough zip code. 2. Print and finish your federal post card application. Easy. 3. Next from wherever you are mail the form set to your local election office. This part was a little Squirrley. You can only send it back on USA sized 8 1/2 by 11 paper. Then mail it in a number 10 envelope. Now, if you’re in Europe where the hell do you easily get the paper or the envelope. The directions say that using European standard paper you need to print the document at 96% of its normal size. On the website they then give you a template to make your own envelope. You also need to note that you cannot have scotch tape on the envelope. So I’m confused, if you’re going to download an envelope and make an envelope do you have to find a recipe for paste? Since we are still in New Jersey we will be hand delivering our 81/2 X 11 postcard. My ballot will be emailed to me. I hope I can email my response back. The county clerk office said I could. Wouldn’t it be great if all of us could vote electronically. But if you don’t get your ballot what can you possibly do? Guess what you can go online and using the federal rights in absentee ballot you are able to vote or you can pick up a hardcopy version from your nearest US Embassy or Consulate location. I got bored reading about it and hope we don’t have to do this. Apparently there are a number of questions that you’ve got to work your way through. Ugh. I am confident that I will get my ballot. I will do my dad proud and vote in the Democratic primary. I will do my home country proud and vote in the general election. A lot to do….but certainly a good cause. I just emailed my application that was downloaded from that site. I should be able to vote in the primary as well. Good for you for making sure your vote will be counted. I wish all the ex pats were as conscientious. Actually I wish all our citizens would get off their duffs and election day and get to the polls. People in other countries risk their lives to vote. Good for you! It’s absolutely shameful and un-American NOT to vote. What’s wrong with people who are too lazy to vote????? We have an embarrassing turnout during elections. Voting is everyone’s responsibility. No matter where one is on Election Day they need to make sure they vote. Great that you figured this out.